An international team of researchers has found that Saturn's fast rotation speed makes it possible for the planet to experience noontime auroras. In their paper published in the journal Nature Astronomy, the group describes the factors that lead to creation of auroras and how Saturn's appear to arise. Auroras on Earth occur when magnetic reconnections (magnetic fields colliding) cause solar flares on the sun. When it happens, plasma carrying a magnetic field is shot out into space, some of which makes its way to Earth. When it collides with our planet's magnetic field, auroras occur. The same process has been observed on Venus, Mars, Jupiter, Saturn and Uranus. In this new effort, the researchers were studying data sent back from the Cassini spacecraft, which orbited Saturn for 13 years. They were looking specifically at data that would provide more information regarding magnetic reconnections on the planet—prior research had shown that they occur on the dayside of the magnetopause (the point where the planet's magnetic field meets the solar wind). There was also evidence that they occur on the nightside of its magnetodisk, which is a plasma ring formed near the equator by water and other materials emitted from its moons. But prior research had also suggested that there would be no reconnections on the dayside of the planet's magnetodisk because the solar winds made the ot too thick for them to occur. But the researchers found evidence of reconnections in the magnetodisk at noontime anyway. The researchers suggest this apparent anomaly is likely due to Saturn's high spin rate (a day is just 10 hours). The high rate, they note, likely compresses the magnetodisk , making it thin enough for reconnections to occur. The team also suggests that the reconnections they measured appear to be strong enough to create auroras. The researchers suggest that their findings indicate that unknown auroras might be happening on other planets as well, but have been overlooked because planet spin speed was not factored into calculations. They further suggest that similar reconnections might also be behind some unexplained pulses seen from Jupiter. Magnetic reconnection is a key process that explosively accelerates charged particles, generating phenomena such as nebular flares, solar flares and stunning aurorae. In planetary magnetospheres, magnetic reconnection has often been identified on the dayside magnetopause and in the nightside magnetodisc, where thin-current-sheet conditions are conducive to reconnection. The dayside magnetodisc is usually considered thicker than the nightside due to the compression of solar wind, and is therefore not an ideal environment for reconnection. 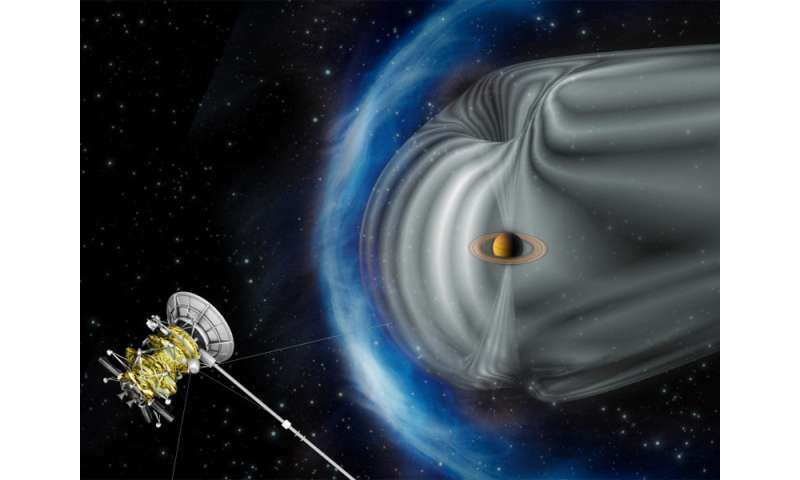 In contrast, a recent statistical study of magnetic flux circulation strongly suggests that magnetic reconnection must occur throughout Saturn's dayside magnetosphere. Additionally, the source of energetic plasma can be present in the noon sector of giant planetary magnetospheres. However, so far, dayside magnetic reconnection has only been identified at the magnetopause. Here, we report direct evidence of near-noon reconnection within Saturn's magnetodisc using measurements from the Cassini spacecraft. The measured energetic electrons and ions (ranging from tens to hundreds of keV) and the estimated energy flux of ~2.6 mW m–2 within the reconnection region are sufficient to power aurorae. We suggest that dayside magnetodisc reconnection can explain bursty phenomena in the dayside magnetospheres of giant planets, which can potentially advance our understanding of quasi-periodic injections of relativistic electrons6 and auroral pulsations. "Magnetic reconnection is (still) pseudoscience"